ParisDailyPhoto: A bust not to bust out of the river banks! 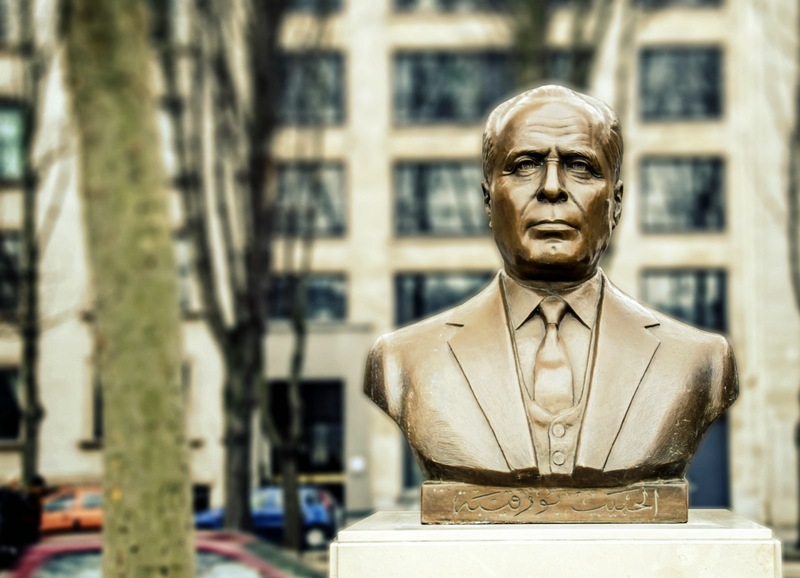 No doubt that the Tunisian President would be delighted with this bust. Nice suit, handsome face. No doubt. Personally, discovering this bust, I immediately received the image of a handsome man, with a serene look, with fine and well designed features. But in the end, I wanted to know what had gone through the life of this man. And I learned much more than what the picture sent to me. This bust is in perfect harmony with the man, its flaws and qualities. But at least I hope he totally assumed it ! BTW, this bust has been inaugurated by the mayor of Paris, in March 2013. It is recent. Yes Alex, flaws and qualities, the founder and leader of the state of Tunisia, but no supporter of democracy. Perhaps a strong ruthless personality is necessary to create a nation in the first place. His party's autocratic rule was finally overthrown in the Arab Spring uprising in 2011. Nice bust though. I do like a nice bust. Yes, very nice bust. He was president of Tunisia for 30 years—I guess they don't believe in term limits. True he was not really what you would call a democrat... But... compared to Ben Ali, his successor, he was Probably what Tunisia needed. Now, they have democracy, but from what we see in the news, it's not that simple (is democracy ever simple mind you?!). Any post yet re Jacques DeMolay along the Seine?